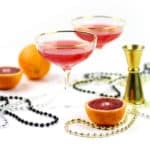 Toast Mardi Gras with a Blood Orange Daiquiri, a ruby twist on the classic New Orleans rum cocktail. Combine all ingredients in a cocktail shaker filled with ice. Shake vigorously. Divide and pour with a fine-mesh cocktail strainer into two coupe glasses.